During the 2018 P4D Week which took place 26 to 30 November, the IITA Youth in Agribusiness office laid out some of the strategies and methods it is employing to encourage youth engagement in agriculture and enhance the growth of youth-led agricultural initiatives. 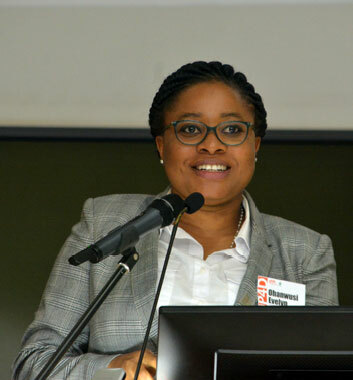 At an earlier presentation, the ENABLE-TAAT Youth Coordinator and Head of the Youth in Agribusiness office, Evelyn Ohanwusi outlined some of the work carried out by the IITA Youth Agripreneurs (IYA) over the years. The original outlook of the IYA targeted various opportunities including creating employment and agribusiness start-up enterprises, which today, account for the highest outcomes. The goal of IYA is to orient rural youth towards productive engagement in agriculture, particularly through expanded opportunities in Agribusiness. Molayo Owoeye, Head of Capacity Development Unit, IYA, gave a presentation on the “Overview of IYA: Approach to training and incubation” in which she talked about strategies in achieving this goal which include development of agricultural business skills; use of improved technology and value chain options; and formation and development of strategic partnerships. Molayo also mentioned the approaches used by IYA such as mind-set change, renovation of abandoned facilities, exchange study visits, organizing training of a wider cross-section of disadvantaged youth through projects, reliance upon mentorship and coaching, and shortened incubation cycle. “A total of 3,123 youth have received training to date with 43% being female. And 30,000 youth will receive training through the IYA collaboration project over the next five years,” said Molayo. Due to its successes, the IYA concept became the basis from which other programs such as the ENABLE Youth Program and ENABLE TAAT have been developed. During his presentation on “Responsive M&E System for Youth in Agribusiness Projects,” Ismaila Mustapha, M&E Officer for ENABLE TAAT, talked about a Monitoring and Evaluation (M&E) System that has been set up and the results framework developed for the youth in agribusiness and the theory of change, which is the underlying assumption that change will occur while engaging youth in agribusiness productively. This is believed to result in a drastic reduction of youth unemployment and an increase in the incomes of youth. Ismaila stated that a key performance indicator had been set up to properly track this level of result at different stages. It is also a performance monitoring plan, which is a powerful tool established to monitor key performance indicators and report to the donors and IITA management as well as flag whatever challenges are being faced in the field in time. This will make it easier to get Management support in addressing these challenges as early as possible and for proper documentation of the achievements and lessons learnt over time.